Have you recently lost one or more teeth? Whether the result of injury or advanced gum disease (periodontitis) you need to restore your lost teeth to enjoy a healthy smile. After addressing the cause of your tooth loss the doctor may recommend replacing them with a lifelike and long lasting prosthetic. Do you need dental implants? In order to maintain your oral health and current facial structure, you need to restore your lost teeth. 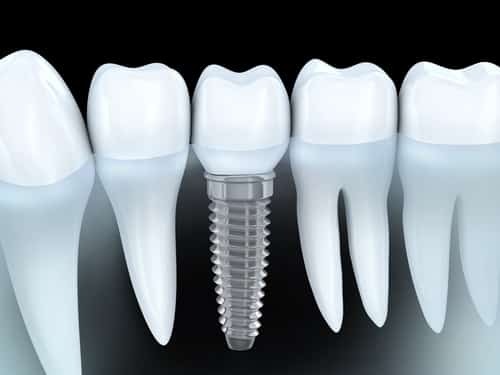 Using dental implants can prevent the loss of jawbone density, avoid further tooth loss and facial collapse, and make your smile whole again. What does the placement process involve? First, the doctor needs to examine your smile to decide where the implant posts will be placed. After surgically inserting the titanium posts, the area will heal and in the process the post and bone tissue will bond. Afterward, a custom-made dental crown will be attached to the post using an abutment. Once complete, the tooth will look and functions like a natural one. Patients can then expect a lifetime of tooth replacement. If you require treatment for gum issues, we can offer periodontal therapy and other possible solutions. For those without enough jawbone tissue to support the replacement tooth, you may benefit from a bone grafting procedure.